Home » Lenormand Blog » What is Lenormand? Lenormand refers to two types of oracle decks – the Grand Jeu and the Petit Jeu. The Grand Jeu (French for the “big game”) is based on a full deck of playing cards. Each card has a large variety of symbols, such as constellations, flowers, and the Trojan War. The Petit Jeu Lenormand (French for the “little game”) is a deck of 36 cards. Its card images are simple – a clover, a bear, a key, etc. It’s this simplicity that leads to the cards not being read based on the picture nor the symbol. 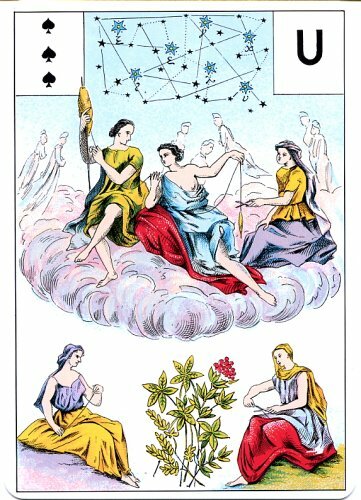 Instead, the meanings tied to the cards are fairly literal, such as luck for the Clover and success for the Key (unlike the philosophical meanings often ascribed to tarot). In this respect, Petit Jeu cards remind me of a pictorial language, much like Ancient Egyptian hieroglyphs. However, both the Grand Jeu and the Petit Jeu are alike in that they use card combinations to expand on the meanings of the individual cards. The more combinations you can make, the more information the cards reveal. This is the reason for the popularity of the Grand Tableau spread for the Petit Jeu (see below for more). The Petit Jeu is what most people refer to when speaking about Lenormand. The decks are easily attained, and books make learning the deck possible. The Grand Jeu – not so much. A lot of the information on how to read it has been lost over the years. As far as I know, there are no books in English on the Grand Jeu. My knowledge of it has come from books in French and from personal experience. The book I use most often for the Grand Jeu is Le livre du grand jeu de Mlle Lenormand by Jean Didier. Note: Because of how much more accessible the Petit Jeu is, I will focus on it for the remainder of this article. Any references to Lenormand cards and decks refer to the Petit Jeu. What is the History of the Petit Jeu Lenormand? The Petit Jeu is believed to be derived from the card game, Das Spiel Der Hoffnung (“The Game of Hope”). It was popular in the late 1700s and early 1800s. It contained 36 cards that were assigned a symbol and playing card. In addition to being a card game, the instructions for Das Spiel Der Hoffnung also explained how to use the cards for fortune telling. The Petit Jeu Lenormand is based on Das Spiel Der Hoffnung’s fortune telling instructions, as well as its card symbols and numbering. The name Lenormand was assigned to the deck to help it sell, trying to cash in on the popularity of Marie Anne Lenormand, one of the most famous fortune tellers of all time. Who was Marie Anne Lenormand? Marie Anne Adelaide Lenormand was a French fortune teller who rose to fame during the time of Napoleon. Originally from Normandy, it was in Paris that she achieved her greatest success. It is believed that she was the advisor to Josephine Bonaparte, Robespierre and Marat. One story of Mlle Lenormand relates how she told Emperor Napoleon that he would ultimately be unsuccessful in his military conquests, leading him to imprison her in the Bastille. While Mlle Lenormand wrote more than a dozen books, they were largely promotional. She never wrote about her fortune telling methods. The little that is known about her methods comes from the writings of people who met her, such as Captain R. H. Gronow, who wrote about his experience in his book, Celebrities of London and Paris. The Grand Jeu was published 2 years after Mlle Lenormand’s death in 1845. The Petit Jeu was published 5 years later. 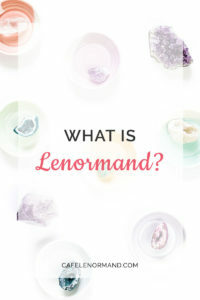 What is Lenormand Used for? Because Lenormand meanings are so literal, they often hit their mark in a way that can be quite eerie. This leads many people to call the cards a fortune telling deck. The deck is used to predict what will happen in a given day, how a relationship will turn out, whether you will get a job, how events will unfold, and so on. If there is an area of your life you would like to know about or some gossip you are would like to hear, Lenormand cards can fill you in on all the details. But be warned that they can also reveal secrets you might like to keep hidden! What are the Schools of Lenormand? The meanings of Lenormand cards are often connected to “schools.” Schools refers to the traditional ways of reading the cards in different countries. The basics of reading Lenormand is the same in countries, i.e., the spreads remain unchanged. 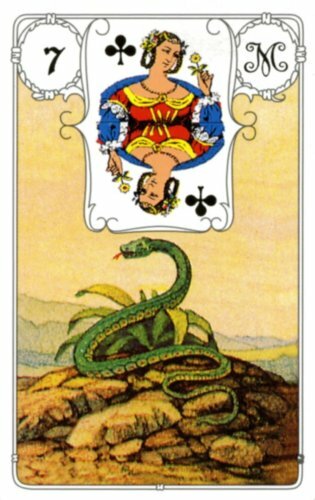 However, the meanings that are assigned to the cards can differ, such as a 9-to-5 job being represented by the Fox card in France, while the Anchor is usually used in Germany and the Moon in Belgium. While different countries use different meanings for some of the cards, it’s actually very few cards that change meanings with the country. But it’s these changes in meanings that have led to the concept of “schools”. Thus, you have the French school, the German school, the Belgium school, and so on. It’s usually only when you are first learning to read Lenormand that you are advised to stick to a specific school so that you don’t get confused by the different card meanings. As you become more familiar with the cards, it is easier to “mix and match” the schools. I have always seen readers from different backgrounds ultimately come up with the same interpretation for a reading, even when using different techniques and meanings. Lenormand spreads tend to be basic spreads, such as the 3 card spread, 5 card spread, 3×3 spread, and the Grand Tableau. For all but the Grand Tableau, the name of the spread explains how it is laid out. For example, a 3 card spread consists of 3 cards laid out left to right, a 5 card spread contains 5 cards spread left to right, and a 3×3 spread contains 3 rows of 3 cards. These are all great spreads to use when you want a quick answer to a question. However, the Grand Tableau (French for the “Big Picture”) is a spread containing all 36 cards that you can analyze for hours. It has two possible formats: laying the cards out in 4 rows of 9 cards (known as the 9×4) or laying the cards in 4 rows of 8 cards and one row of 4 cards (known as the 8×4+4). There are many Lenormand decks available for purchase today. They range from traditional decks, such as the Blue Owl, to interpretative decks that closely follow Lenormand, but with some deviations, such as the Celtic Lenormand deck.